Elsheimer, Adam (1578-1610). German painter, etcher, and draughtsman, active mainly in Italy. Although he died young and his output was small he played a key role in the development of 17th-century landscape painting. He was born in Frankfurt, where he absorbed the Coninxloo tradition, and moved to Italy in 1598. In Venice he worked with his countryman Rottenhammer, then settled in Rome in 1600. 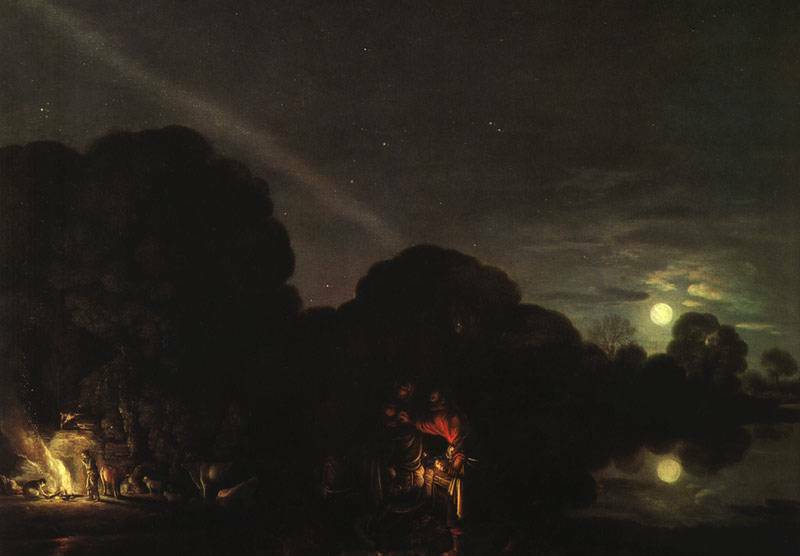 His early Mannerist style gave way to a more direct manner in which he showed great sensitivity to effects of light; his nocturnal scenes are particularly original, bringing out the best in his lyrical temperament, and he is credited with being the first artist to represent the constellations of the night sky accurately (The Flight into Egypt, Alte Pinakothek, Munich, 1609). He painted a few pictures in which figures predominate, but generally they are fused into a harmonious unity with their landscape settings. They are invariably on a small scale and on copper (the only exception is a self-portrait in the Uffizi, Florence, of doubtful attribution), but although exquisitely executed they have a grandeur out of all proportion to their size. Both Rubens (Staatliche Kunstsammlungen, Kassel) and Rembrandt (National Gallery, Dublin) made paintings of The Flight into Egypt inspired by Elsheimer's masterpiece, and his influence is apparent in the work of many other 17th-century artists.